This lipstick seems to have been a massive hit between bloggers for autumn/winter and I can see why! New Lasting Finish Matte by Kate Moss. Kate Moss brings colour to a new unique dimension. 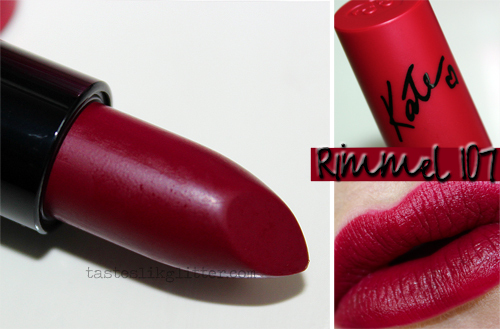 The gorgeous colour richness and comfort of Kate’s lipstick, now in a velvety matte finish. Ruby powder enriched formula to intensify the colour while keeping a matte finish all day long! Matte is re-invented for the most velvety comfortable colour EVER! For a while now I've been wanting a darker red lippie but all the ones I came across were too brown or just too dark in general. It wasn't long before I kept seeing a sultry deep red lip popping up on my Instagram feed. I asked the girls that posted the photos what it was and I got the same reply from all of them - Rimmel 107. I must have it! This, to me, is the perfect winter-y red. I find it to be a very neutral wearable red. It doesn't lean too cool or too warm. It's one of those that tends to look slightly different depending on your colouring. The finish isn't strictly matte. It has the pigmentation and 'stick' of your typical matte. I can go about my day without needing to constantly check if it's migrated but it does come with a slight sheen on first application. That fades away after time though and you're left with a regular matte finish that lasts. The creaminess makes it so much easier to apply. I can often struggle with application for dry mattes but this is a breeze. I've worn this with both colourful eyes and more toned down shadows and it fits in well with both. If you're looking for a deep red shade for the colder months, definitely look into picking this up. It really is a fabulous lipstick.